The Bad Kitty Bakery: I have a Zoku! I am excited almost beyond words! 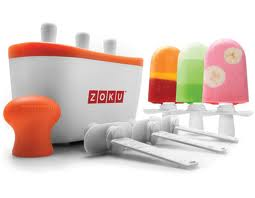 This afternoon my wonderful mother-in-law, Patti got me a Zoku ice pop maker for my birthday. I went back and grabbed a few accessories, including a case and tools. Now my mind is racing with a thousand flavor combinations. I have planed peanut butter and chocolate pops, chai latte pops, and lots of frozen fruit pops. I picked up some cherry cider from Trader Joes that will find its way into that ice pop mold. I think the flavors are endless, and the best thing is I get to take pictures and post recipes up here! So far, the actual Zoku looks easy to use. It does say on the website and some blogs that thick mixtures or mixtures with low sugar do not do very well. Therefore, I am going to get a backup, plain old ice pop mold from Amazon, too. I love the idea of making food for my loved ones, including icy treats. The mold will be ready to use tomorrow, because you have to freeze it overnight. The first one I am thinking of making is Mojito so I will let you know how those work out. Yay! Off to plan recipes! I actually have two bases so that I always have one at that ready. I also will sometimes use both bases at once. I found the storage units worthy of the money and own several, as well as multiple sets of sticks. I hope you enjoy your Zoku as much as I have.